We are happy to announce that TecKids, a non-profit specialising in working with kids, teaching them technonology, and fostering self-sustaining communities amongst them, will be holding a workshop from 15.08. to 18.08. Admission is free of charge, but registration through TecKids’ web form is mandatory. Registration is open until Tuesday, 11 August. You will be kept up to date on any changes to the schedule and other details by the TecKids team after registration. It is important that you check mail before heading to DebConf in order to receive any last-minute informations. The interest to participate in DebConf15, which will start in 10 days, has been overwhelming. Thank you so much! We planned the conference for 350 people and we now expect more than 570. 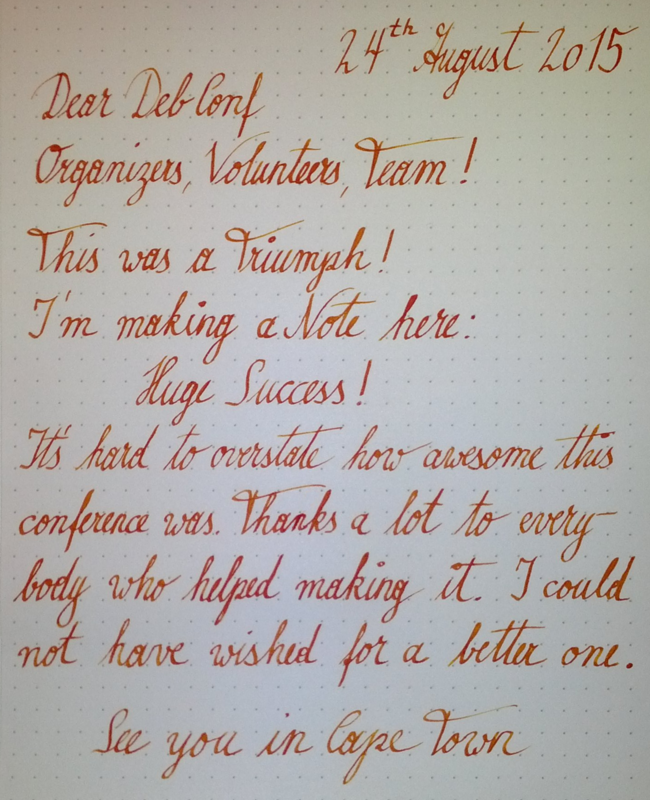 This is fantastic and a wonderful support and encouragement for Debian and its contributors. But we are getting to the point where we have to prioritise considerations about the capacity of the venue and the safety of our attendees. We’ve therefore had to close registrations until we have evaluated further options for accomodating even more attendees. For those of you who did not register for DebConf on time, but still want to participate, please bear with us and make sure to check back soon. 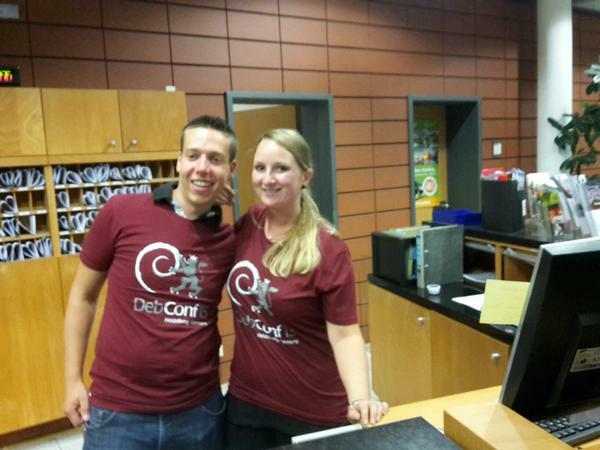 The DebConf content team is pleased to announce the schedule of DebConf15, the forthcoming Debian Developers Conference. From a total of nearly 100 talk submissions, the team selected 75 talks. Due to the high number of submissions, several talks had to be shortened to 20 minute slots, of which a total of 30 talks have made it to the schedule. In addition, around 50 meetings and discussions (BoFs) have been submitted so far, as well as several other events like lightning talk sessions, live demos, a movie screening, a poetry night or stand-up comedy. The Schedule is available online at the DebConf15 conference site. Further changes to the schedule can and will be made, but today’s announcement represents the first stable version. The full list of invited and featured speakers, including the invited speakers profiles and the titles of their talks is available here. DebConf is not just for Debian Developers, we welcome all members of our community active in different areas, like translation, documentation, artwork, testing, specialized derivatives, and many other ways that help make Debian better. In fact, we would like to open DebConf to an even broader audience, and we strongly believe that more diversity at DebConf and in the Debian community will significantly help us towards our goal of becoming the Universal Operating System. The DebConf team is proud to announce that we have started designing a specific diversity sponsorship programme to attract people to DebConf that would otherwise not consider attending our conference or not be able to join us. In order to apply for this special sponsorship, please write an email to outreach@debian.org, before July 6th, about your interest in Debian and your sponsorship needs (accomodation, travel). Please include a sentence or two about why you are applying for a Diversity Sponsorship. You can also nominate people you think should be considered for this sponsorship programme. Please feel free to send this announcement on to groups or individuals that could be interested in this sponsorship programme. And we’re also looking forward to your feedback. We’re just getting started and you can help shape these efforts.